Card Text Action: Deal 1 to a creature. If this damage destroys that creature, gain 1 . Can I use Seeker Needle’s “Action:” ability on my own creatures? Yes. 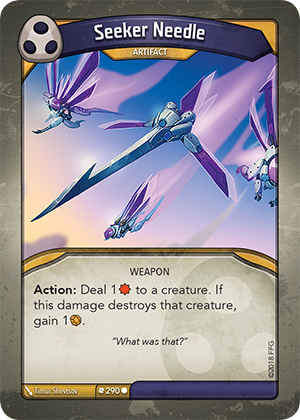 There is no wording on this card that limits which creature can be targeted (e.g. “enemy creature” or “friendly creature”). Therefore, Seeker Needle can target any creature, including your own. This can be useful with cards like Bad Penny.